For Sonoma County, California creek, see Arroyo Seco Creek. The Arroyo Seco, meaning "dry stream" in Spanish, is a 24.9-mile-long (40.1 km) seasonal river, canyon, watershed, and cultural area in Los Angeles County, California. The area was explored by Gaspar de Portolà who named the stream Arroyo Seco as this canyon had the least water of any they had seen. During this exploration he met the Chief Hahamog-na (Hahamonga) of the Tongva Indians. The watershed begins at Red Box Saddle in the Angeles National Forest near Mount Wilson in the San Gabriel Mountains. As it enters the urbanized area of the watershed, the Arroyo Seco stream flows between La Cañada Flintridge on the west and Altadena on the east. Just below Devil's Gate Dam, the stream passes underneath the Foothill Freeway. At the north end of Brookside Golf Course the stream becomes channelized into a flood control channel and proceeds southward through the golf course. 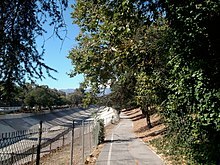 The Arroyo Seco goes through Pasadena, where it passes the Rose Bowl Stadium as it goes through Brookside Park. The Arroyo Seco stream, which is fed by a watershed of 46.7 square miles (121.0 km2), helps to replenish the Raymond Basin, an aquifer underlying Pasadena that provides about half of the local water supply. This arroyo is one of two major streams that capture rainfall and storm water in Pasadena, the other being Eaton Wash on the eastern side of the city, which is a tributary of the Rio Hondo watershed. 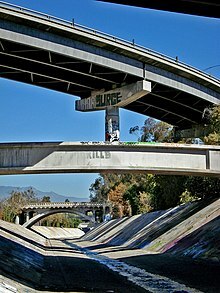 The Arroyo Seco then passes under the Ventura Freeway and the Colorado Street Bridge, and it crosses the Raymond Fault at the southern boundary of Pasadena at the San Rafael Hills. The channel continues along the western boundary of South Pasadena, then into northeast Los Angeles flowing southeast of the Verdugo Mountains and Mount Washington. The Arroyo Seco then proceeds through the Los Angeles neighborhoods of Highland Park, Hermon, Montecito Heights, and Cypress Park. It ends at the confluence with the Los Angeles River near Elysian Park, north of Dodger Stadium and Downtown Los Angeles. 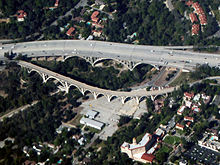 The Arroyo Seco Parkway, or Pasadena Freeway, runs parallel to the channelized Arroyo Seco from South Pasadena to the Los Angeles River. Above Devil's Gate, the rapids of the Arroyo Seco are positioned so that the falls make a beating, laughing sound. In Tongva-Gabrieliño traditional narratives, this is attributed to a wager made between the river and the coyote spirit. The Arroyo Seco was one of the Los Angeles River tributaries explored by Gaspar de Portola in the late summer and fall of 1770. He named the stream Arroyo Seco, for of all the canyons he had seen, this one had the least water. During this exploration he met the Chief Hahamog-na (Hahamonga) near Millard Canyon, at the settlement later known as Hahamongna - California. This band of the Tongva Indians would end up gathered into the fold of the San Gabriel Mission and with other bands and tribes collectively called "Gabrielenos." With the 1874 establishment of the community of the Indiana Colony, the new residents built their homes along today's Orange Grove Boulevard, the major north-south avenue paralleling the Arroyo on the east. However, the deep and seasonally flooded Arroyo presented a barrier to easy travel and transportation between renamed Pasadena and Los Angeles. Stories of four and five hours just crossing the chasm, whether exaggerated or not, abounded in Pasadena history. The first recorded American to live in the Upper Arroyo (north of Devil's Gate) was simply known as "Old Man Brunk". Brunk's cabin stood at a large bend in the canyon, roughly where the Forest Service housing is today. It was said he left San Francisco "for that town's good". Dating back to the original Tongva residents of the area, the Arroyo Seco canyon has always served as a major transportation corridor. Today it links downtown Los Angeles with Pasadena, the west San Gabriel Valley and the San Gabriel Mountains. 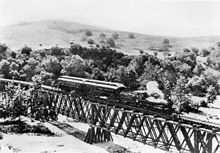 By 1886 the Los Angeles and San Gabriel Valley Railroad had been established from Downtown Los Angeles with a grand wooden trestle that cut a straight line crossing from the west side to the east. The wooden trestle was replaced with the Santa Fe Arroyo Seco Railroad Bridge. Eventually this line would hook up with rail lines built from the east to create the cross-country course of the Santa Fe Railroad. For local commutes, an electric traction trolley was put in and operated by the Pacific Electric Railway, a Henry E. Huntington enterprise, which ran the "Red Cars" from the upper Arroyo and Pasadena through the San Gabriel Valley into Los Angeles and many points beyond. The lower Arroyo Seco was served by the Los Angeles Railway "Yellow Car" lines. In 1900 Horace Dobbins, Mayor of Pasadena, opened his innovative California Cycleway, an elevated wood structure with a flat planked surface that would allow bicyclers to travel from Pasadena to Los Angeles avoiding the uncertain schedules of the early trains. Dobbins was only able to build a two-mile portion of the cycleway from the Green Hotel to Raymond Hill before competition from the railroads and the growing popularity of the horseless carriage undermined the project. Present day cycling activists are reviving a vision and plan for a dedicated bikeway from Pasadena to Los Angeles. The Arroyo Seco bicycle path now runs from Highland Park to South Pasadena. In 1913 the Colorado Street Bridge was dedicated. This structure curves across the Arroyo accessing Eagle Rock, Glendale, and the San Fernando Valley. During the Stock Market Crash of 1929 and the subsequent Great Depression of the 1930s, the bridge was a jumping off point for many committing suicide, whereby it received the ignoble name of "Suicide bridge." By the 1980s the bridge fell into disrepair as chunks of concrete dropped from its face to the armory parking lot in the Arroyo below. After the San Francisco–Oakland Bay Bridge failure in the 1989 Loma Prieta earthquake, the Colorado Street Bridge was closed as a precautionary measure. Eventually assistance from the Federal Bridge Repair and Replacement Fund and other local governmental agency discretionary funds provided funding for the complete restoration and seismic retrofit of the bridge. The total project budget amounted to $24 million, and the Colorado Street Bridge was reopened on Dec. 13, 1993, on time and on budget. The automobile had long become a mainstay of Southern California life. In 1940 the Arroyo Seco Parkway, the first freeway, was built as a parkway alongside the newly constructed flood channel in the Los Angeles portion of the Arroyo. Today, also known as the Pasadena Freeway, it continues on through downtown becoming the Harbor Freeway, and terminates near the harbor in San Pedro. The Arroyo Seco Corridor Management Plan was completed for the "Arroyo Seco Parkway" in 2004. The Plan was created through a partnership with the National Trust for Historic Preservation, the National Scenic Byways Center (Federal Highways), Caltrans (State Highways), the National Park Service, the Santa Monica Mountains Conservancy, and The Center for Preservation Education and Planning (CPEP Inc.). The Arroyo Seco Flood Control Channel, was built by the Works Progress Administration before and during construction of the parkway to avoid damages from future floods. Despite its name, the Arroyo Seco generally has a flow of several cubic feet per second, but periodically it is inundated by torrential floods from its steep, erosion-prone mountain watershed. The reputation of Arroyo Seco floods led the Spanish to site the original Pueblo de Los Ángeles away from the confluence of the Arroyo Seco and the Los Angeles River. Historically, these floods would race down the stream bed and overflow through Pasadena, South Pasadena, Alhambra and Los Angeles communities all the way to the Los Angeles River. As Los Angeles developed into a city and grew outwards, the damage from these floods was particularly severe in 1914 and 1916. 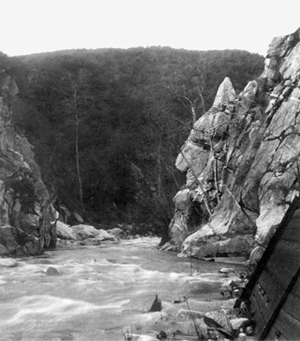 In 1920 flood engineers from the Los Angeles County Flood Control District built Devil's Gate Dam in the Arroyo Seco, the first flood control dam in Los Angeles County. It is managed by the Los Angeles County Department of Public Works. Named for a rock outcropping which resembles the face of a devil, Devil's Gate gorge, located in northern Pasadena between La Cañada Flintridge and Altadena, is the narrowest spot on the Arroyo Seco's course below Millard Canyon. The construction was by the Bent Brothers Company. Above the dam is the flood basin which captures the flows of the mountain watershed of the Arroyo Seco. This area is now called "Hahamongna", a phrase meaning "Flowing Waters, Fruitful Valley", a remarkably different designation than the name given the area by the Spanish explorers. Hahamongna also refers to the original Native American tribe of the Tongva Indians who once inhabited the area. By 2011, the flood basin had filled with debris brought down after the 2009 Station Fire, reducing its effectiveness as a flood control measure. The County of Los Angeles conducted public hearings on the Environmental impact statement before selecting a method to remove debris from the Hahamongna area. In 2014, the Board of Supervisors approved a five-year project to remove 2.4 million cubic yards of sediment (1,800,000 m3) from the basin despite strong opposition from neighbors and recreational enthusiasts. The opponents contend that hundreds of trucks would be required that would increase pollution and noise. They also say that the wildlife habitat will be destroyed and interfere with hikers, cyclists and horseback riders who use the area for recreation. The alternative supported by Pasadena officials would have removed 1.4 million cubic yards of sediment (1,100,000 m3) and provided regular maintenance. County officials supported removing more sediment to reduce the flood risk for most major storms. Below Devil's Gate Dam, most of the Arroyo Seco creek, with two short exceptions, is contained in a concrete channel that contains stormwater and municipal runoff. This channel and other similar flood control structures throughout the Los Angeles Basin and along the foothills of the San Gabriel Mountains were built following the devastating Los Angeles Flood of 1938. For more than one hundred years, the natural environment of the Arroyo Seco and its proximity to a large urban population have inspired efforts to protect, manage and preserve it. L.A. County flood control was first founded in an effort to control the wild waters of the Arroyo Seco and Charles Lummis founded the Arroyo Seco Foundation in 1905 for the purpose of preserving recreational use and habitat, residents in Los Angeles and Pasadena contributed generously to efforts to buy up open space in the great canyon to protect for future generations. Arroyo Seco Watershed Restoration Feasibility Study 2002 A cooperative partnership of North East Trees and the Arroyo Seco Foundation, this report released in May, 2002, provides a blueprint for restoration and better management for the watershed. The study contains a series of valuable technical reports on hydrology, biology, water resources and recreational uses. US Army Corps of Engineers Arroyo Seco Watershed Reconnaissance Study 2002 - Evaluates watershed conditions and determines there is a federal purpose in Arroyo Seco work. Arroyo Seco Watershed Coordination Program (Arroyo Seco Foundation) 2004-ongoing Builds the capacity of local groups to cooperate and collaborate in watershed management. In addition to educational programs about California's water issues and local water programs, this program supports the Council of Arroyo Seco Organization, a network of Arroyo improvement groups. Arroyo Seco Parkway Corridor Management Plan 2004 Parkway management plan prepared for Caltrans by the National Scenic Byways Center, Federal Highways, the National Trust for Historic Preservation, and the Center for Preservation Education and Planning (CPEP, Inc.). This plan serves as the basis for signage and other recent improvements on the parkway. USACE Arroyo Seco Watershed Feasibility Study 2005 - ongoing This study, conducted by the US Army Corps of Engineers with the County of Los Angeles and other local partners is evaluating the watershed to determine the best program to improve water resources, habitat and recreational opportunities; the study, which actually began in 2001 continues on a slow pace, but local sponsors hope that it will provide a basis for federal support of local restoration and management efforts. Central Arroyo Stream Restoration Program 2007–2008 This program, which has now been completed, has improved stream conditions and water quality in the Arroyo Seco stream by habitat restoration, parking lot and trail improvements and trash capture devices. As a result, the Arroyo chub, a native fish that once thrived in the stream but was wiped out by the flood control measures, has now been reintroduced to the stream. Fish Restoration in the Arroyo Seco 2008 This study, conducted by C. Camm Swift, evaluates the potential for fish restoration in the stream and makes recommendations about needed improvements. Arroyo Seco Watershed Assessment 2010 This program provides an assessment of major projects to restore and enhance the Arroyo Seco Watershed and is intended to inform the Corps of Engineers ecosystem study of the Arroyo. The study was prepared by CDM for the Arroyo Seco Foundation. Hahamongna Cooperative Nursery 2015 Hahamongna Cooperative Nursery is a grassroots habitat restoration initiative led by the Arroyo Seco Foundation in partnership with Pasadena Water and Power and Pasadena Public Works Department. Under the leadership of Nursery Manager Nick Hummingbird, volunteers are working to propagate local native plant species for habitat restoration as part of the Arroyo Seco Canyon Project, a joint project with Pasadena Water and Power. In the process, volunteers learn about the Arroyo's native flora and ecology, horticultural technique, nursery management, and local ethnobotany. Restore full flood control functions in the Arroyo Seco area. Better manage, optimize, and conserve water resources while improving water quality. Improve regional park recreational opportunities and enhance nature reserve open space. The restoration efforts are being carried out by the County of Los Angeles and local cities, primarily the City of Pasadena. Early rocket-engine-testing began in the Arroyo Seco in 1936 and this led to the establishment of the Jet Propulsion Laboratory (JPL) at the mouth of the Arroyo Seco by the California Institute of Technology. During the 1950s, JPL was heavily involved in rocket testing, and the roar of rocket engines could be heard emanating from the Arroyo Seco area for miles. These rocket projects were terminated at the facility by 1958. By the mid-1960s, JPL had become instrumental in the development, launching, and tracking of a number of unmanned near-Earth and deep-space space probes for the National Aeronautics and Space Administration. One notable project was the Mars Rover, which has returned a number of panoramic photos of the Martian surface. JPL has been criticized by regional environmentalists and the community for its water pollution of the local groundwater with toxic chemicals, such as solvents and perchlorate rocket fuel accelerants. A monumental cleanup project by NASA has begun, which includes a multimillion-dollar pumping and water filtration system to treat the groundwater, removing toxins until the aquifer contamination level has been reduced below their federally-specified limits. This project is carried out by a NASA project team and monitored by the U.S. Environmental Protection Agency. Frequent public meetings are held with public comment, and recorded for the record on the quality and progress of the clean-up. Upper Arroyo Seco: Switzer Falls in the Angeles National Forest. The many great places to visit in or near the Arroyo Seco have made it one of the most popular hiking spots in Southern California. 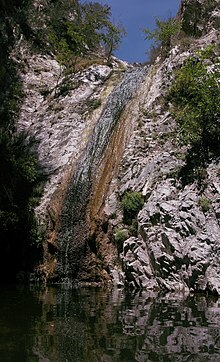 The mountainous part of the Arroyo Seco is located within the Angeles National Forest. Angeles Crest Highway skirts the western edge of the Arroyo Seco Canyon. Millard Canyon, located near the mouth of the Arroyo, is a delightful canyon with an impressive waterfall. Sunset Ridge The trail skirts the eastern side of the canyon, the eastern boundary of the Arroyo Seco Watershed. 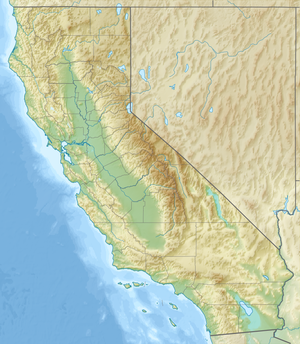 Millard Canyon was a major pedestrian thoroughfare for Tongva, Serrano people, and other Californian Native Americans traveling between the Los Angeles Basin coastal plain, the San Gabriel Mountains, and the Mojave Desert regions of Southern California. Brown Mountain Truck Trail, which begins near the confluence of El Prieto Canyon and proceeds across the front range of the San Gabriel Mountains to upper Millard Canyon, offers impressive vistas of the San Gabriel Valley. The Burton Trail descends from this road to the upper stretches of the Arroyo near Oakwilde Campground. The Gabrielino Trail, which is a popular journey for hikers, equestrians and bicyclists, travels up the steep canyon. "El Alisal"—Lummis House - historic home museum and native plants gardens. Heritage Square Museum - historic Victorian houses park. The Colorado Street Bridge over the Arroyo, with the San Gabriel mountains in the background, around 1920. 1913 view looking north at the Colorado Street Bridge over the Arroyo, under construction and the Scoville Bridge behind. A 1913 view of the Scoville Bridge next to the partially completed Colorado Street Bridge. ^ a b "Arroyo Seco". Geographic Names Information System. United States Geological Survey. 1981-01-19. Retrieved 2013-11-12. ^ "USGS Gage #11098000 on Arroyo Seco near Pasadena, CA" (PDF). National Water Information System. U.S. Geological Survey. 1911–2012. Retrieved 2013-11-12. ^ "File Not Found". ww2.cityofpasadena.net. ^ "Arroyo Seco Water Resources Report" (PDF). ^ Information has been derived from the archives of the Pasadena Museum of History and the Arroyo Seco Foundation. ^ Pasadena, Hiram Reid, 1895. Out of Print. A comprehensive history of Pasadena after 20 years of colonization. ^ Trolley Days in Pasadena, 1985, Charles Seims. ^ Project co-authors for the Arroyo Seco Corridor Management Plan were: Dan Marriott, National Trust for Historic Preservation and Jeffrey Samudio, Executive Director, Center for Preservation Education and Planning, Hollywood and Partner of Design Aid Architects. ^ "USGS Current Conditions for USGS 11098000 ARROYO SECO NR PASADENA CA". nwis.waterdata.usgs.gov. ^ "Arroyo Seco Flood Timeline" (PDF). ^ Arroyo Seco Foundation. "Arroyo Seco Watershed - Arroyo Seco Foundation". arroyoseco.org. Retrieved 29 July 2015. ^ "National Bridge Inventory Database". Retrieved 2009-10-30. ^ "Angeles National Forest - Home". fs.fed.us. Retrieved 29 July 2015. ^ "Parks - LAMountains.com". 25 September 2010. ^ "Pasadena Roving Archers". Pasadena Roving Archers. ^ "PCC Home - Pasadena Casting Club". www.pasadenacastingclub.org. Wikimedia Commons has media related to Arroyo Seco (Los Angeles County). Arroyo Seco Neighborhood Council — City of Los Angeles neighborhood council for communities/neighborhoods in the Arroyo Seco.